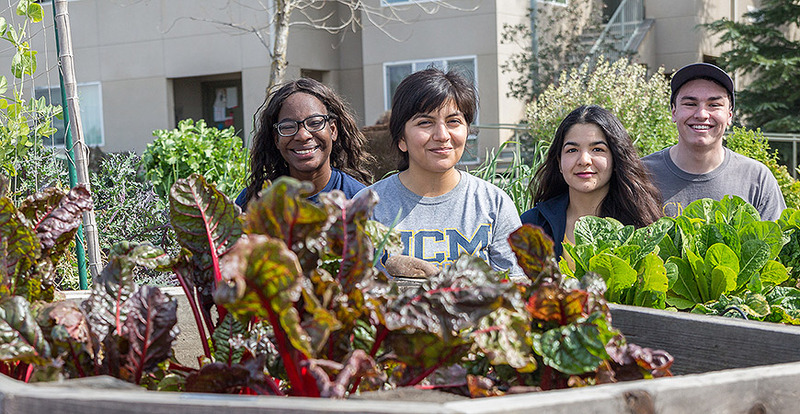 Students tend the UC Merced Campus Community Garden. UC Merced demonstrated that it’s living up to its reputation for being “green from the ground up” by winning five awards — more than any other University of California campus — in the 14th annual Higher Education Energy Efficiency and Sustainability Best Practice Awards. The California Higher Education Sustainability Conference (CHESC) highlights cutting-edge research and case studies in curriculum development, operational programs and community partnerships. Jointly organized by California Community Colleges, California State University and the University of California, the goal of the conference is to create opportunities for dialogue and best practices across institutions. Bobcat Eats is a literacy program that provides a monthly workshop designed to promote food systems awareness and features local community farmers. The program has assisted UC Merced in meeting the UC’s sustainability policy requirement that mandates the campus to procure 20 percent sustainable food products by 2020. This award highlights a program, organization, or group that has integrated sustainability into campus foodservice in one (or more) of the following areas: procurement, operations, education and community outreach. Established in March 2017, CropMobster is a free countywide food system website where community members, farms, businesses and anyone else can post, find and share alerts about anything related to the food system. The goal is to reduce food waste, decrease food insecurity, improve farmer and small business sales, develop local leaders and build the community. The award highlights campuses that have built relationships and ongoing partnerships with organizations and institutions outside of the campus to further sustainability efforts. The LEED Platinum-certified Classroom and Office Building 2. The Chancellor’s Advisory Committee on Sustainability and the Office of Sustainability worked with campus administration to facilitate a series of workshops to inform the development of UC Merced’s Sustainability Strategic Plan. The plan provides a high-level overview of campus sustainability goals through 2022 and defines the roles of campus stakeholders. It was designed as a living document to be reviewed annually with a progress report that outlines accomplishments. This award recognizes innovative planning documents and efforts that include multiple areas of sustainability and honors plans that institutionalize sustainability at the campuswide level. 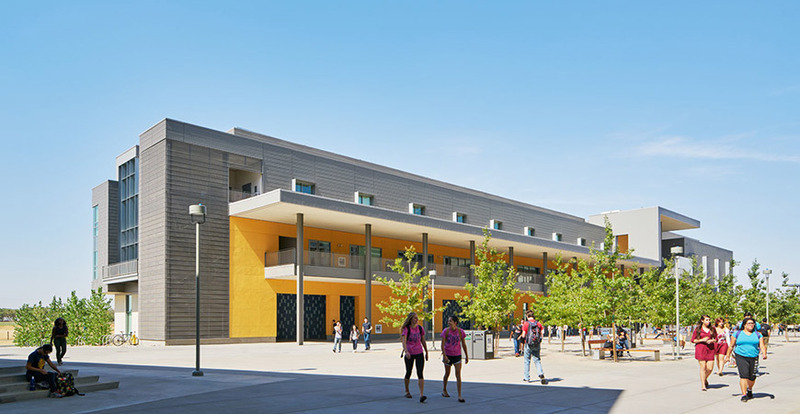 The three-story, LEED Platinum-certified Classroom and Office Building 2 won this award for best overall design for energy efficiency in a new building or major building renovation. Opened in 2016, COB2 was designed with some of the newest sustainable technologies and features to date. The biggest contributor to its Platinum certification is its passive solar design for windows, walls and floors that were designed to collect, store and distribute solar energy in the form of heat in the winter and reject solar heat in the summer. UC Merced was one of 12 campuses honored as part of Energize Colleges, a unique network of two- and four-year public and private institutions from across California that work to collaborate on a uniformly designed yet flexible sustainability internship program for students. With help from numerous collaborators, students have established lasting sustainability features at their respective campuses through their internship projects. Not only do projects result in energy and cost savings, but they also successfully engage multiple stakeholders in learning about sustainability.